Trying to properly comprehend the causes behind the 2007-2010 financial crisis created by the housing and credit bubble is practically impossible. If a friend who thinks he or she understands figures and tells you in a couple of sentences what occurred or how it came about, ignore them. They really don’t know. 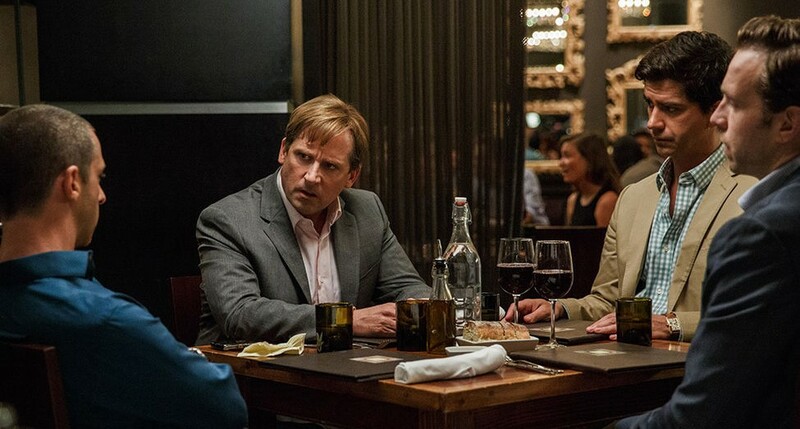 That’s not to say it can’t be understood, it’s just that the events that lead to Wall Street’s atomic bomb of fraud, stupidity and greed are so incredibly complex, even a 130 minute film that goes to great pains to spell things out in terms a layman should appreciate will often remain difficult to grasp, but The Big Short certainly tries. For instance, did you know that the seeds were actually planted thirty years prior with a great idea for investment only to have it all come crashing down in 2008? 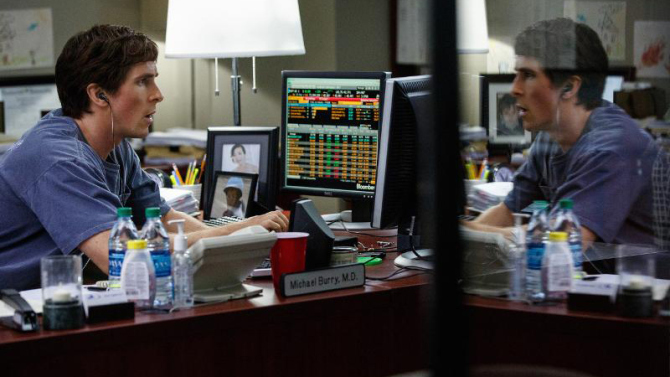 Based on the novel The Big Short: Inside the Doomsday Machine by Michael Lewis, director Adam McKay has crafted his film in the manner of an urgent, rough-around-the-edges, comic drama. With characters glancing at the camera, celebrities appearing as themselves explaining complicated plot points in a way we should understand, fast edits of music videos and Ryan Gosling glancing over his should to tell us, “Trust me, this really happened,” it’s like watching a hip documentary financed by MTV. One thing is clear: It took certain types of unconventional personalities to grasp where the economic flow was going and how to swim against it. With the occasional exception of a character looking directly at us and admitting for storytelling purposes, “Okay. So it didn’t happen exactly like that,” the film appears to be a mostly accurate facsimile of events, which only goes to fuel the anger you should feel by the film’s conclusion. Some of the key characters have name changes. 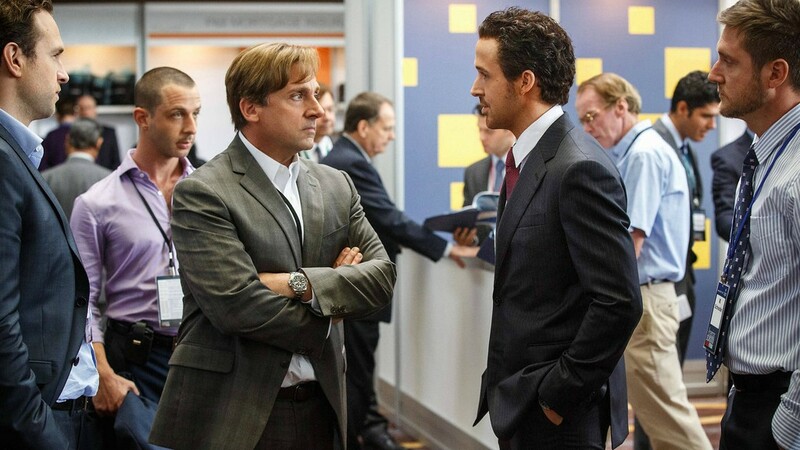 Hedge fund manager Steve Eisman becomes Mark Baum (Steve Carell); Deutsche Bank trader Greg Lippman becomes Jared Vennett (Ryan Gosling), and Ben Hockett becomes Ben Rickert (Brad Pitt). Facts, figures, and occasionally short moments of animation come at us with such overwhelming, dazzling speeds, that from time to time, the film brings in a famous name to explain in lay terms what you just heard. Thus we have Margot Robbie giving an overall account of things from a bubble bath while drinking champagne, chef Anthony Bourdain equating economics with examples of a new kitchen recipe, and Selena Gomez at a Las Vegas roulette table explaining how investors gambled, how far reaching that gambling went, and how they all lost. They’re gimmicks, but they’re surprisingly effective. 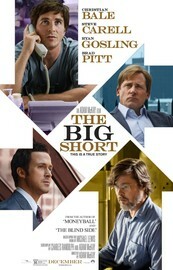 The Big Short is a fascinating watch, not only because of its undeniable importance but because of that sense of urgency that comes not only from McKay’s direction or Hank Corwin’s split-second editing, but because of the performances. It’s a large cast but there’s not a weak link. You believe that these actors believe in what they’re doing, and it’s this energy that engages and draws you in from the second the film begins. For both Ryan Gosling and Steve Carell, these are arguably the best performances of their careers. There’s a moment when you realize that this small group of oddball individuals may not be any better than all the greedy individuals of Wall Street – they’re aiming to get rich from the disaster they know is about to happen – so there’s a welcomed sense of relief when Brad Pitt’s Ben Rickert shows genuine concern by pointing out the reality of what he and others have just done. “We just bet against the American economy,” he states. Plus, when Carell’s Mark Baum finally grasps the big picture and realizes that the world’s economy may collapse and potentially put everyone back in the dark ages, there’s nothing to celebrate. “I actually feel pretty sick,” he says. And so should we all, particularly with the knowledge that today, nothing has really changed. It’s all incredibly sad.